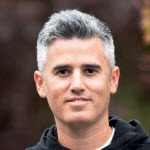 Byron Baker is a UX Strategist with over 15 years experience consulting in the areas of design, user experience, research, and product development. He has consulted for American Express, Abbott Labs, Eli Lilly, Microsoft, BAE Systems, FarmCredit, MasterCard, FedEx, Fujitsu, Danaher, Chevron and others. He has presented at several conferences on the benefits of UX design and research and was a guest lecturer and part-time faculty member for the iSchool department at the University of Washington. He holds a Bachelor’s of Fine Art from the University of Washington in Photography and Visual Communication.